I recently ran my 2nd half marathon of the year, and it was the first race I was able to push myself and see how my running time has improved. Aside from the half Ironman, my last half marathon was Rock N Roll Dallas in March. 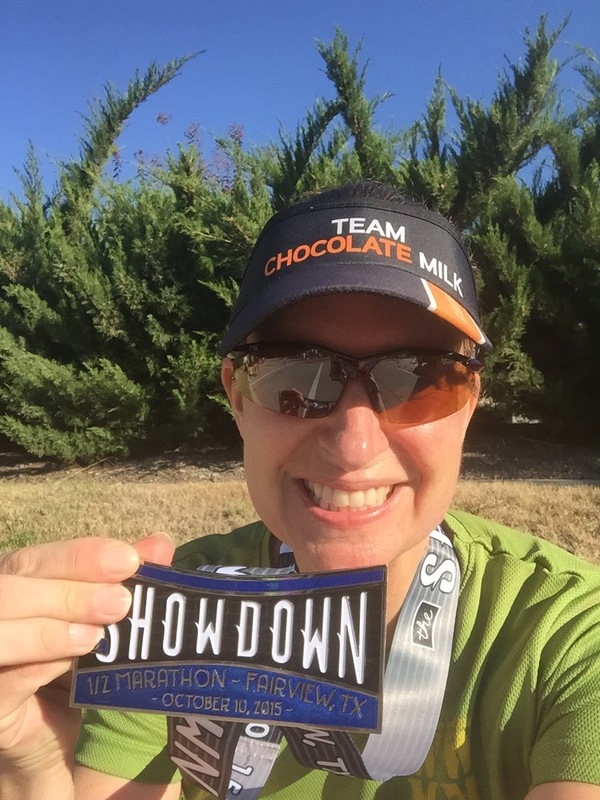 So I was a little excited to run the Showdown half and check the reality of my four hour marathon goal. The race is well done. 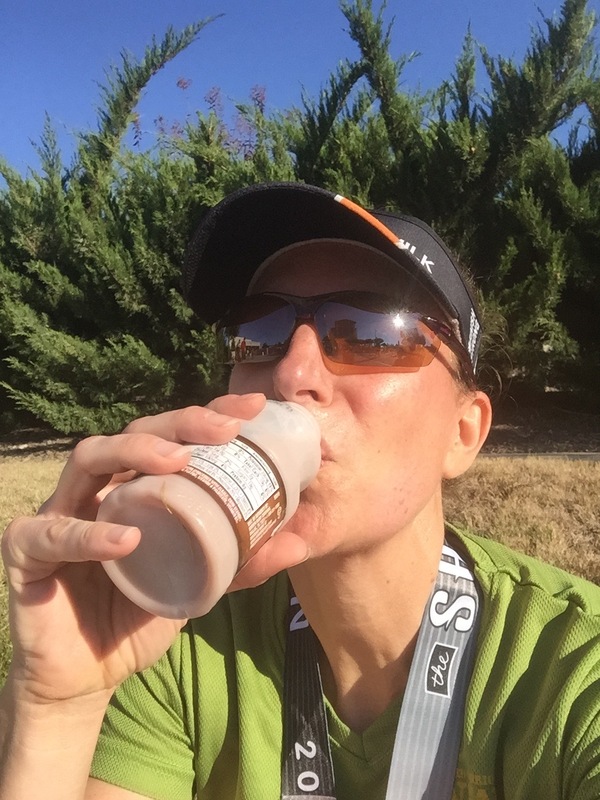 There are pacers, plenty of course support, and best of all – chocolate milk at the finish. I need the hills to prepare for the Dallas Marathon. It’s not a flat course, and the toughest hills fall after mile 13. My training partner was running it as well, so we rode to the race together. Races are more fun with friends. The morning of the race, the weather was perfect. A cool front had moved in and it was around 51 degrees at the start. My perfect running weather falls in the range of 45 to 50 degrees. I couldn’t believe after all the heat and humidity, that we were actually getting a break on race day. My friend and I talked about where to start the race. Do we start in front of the 2:00 pace group or with 1:55? I really had no idea what to expect out of myself, so she decided on 1:55 and we lined up behind the pacers. I hoped to be under 1:55, and secretly was hoping to be in the 1:53 range. After looking at my Garmin at the end of the first mile (8:37!) I wondered if I was screwing up my race too early. But the pace felt comfortable, great even, and I felt so light on my feet! We stayed with the pacers at least through mile 6. At times I felt like I was holding back. I had more. Close to mile 7, my friend pulled off to make a quick stop and told me to go on ahead. She’s been battling foot problems (most likely plantar fasciitis) for the last few weeks, and after stopping it would take her a bit to get warmed up again. I know that feeling all too well. Being in the second half of the race, I decided to pull ahead of the pace group. I think it’s possibly the most miles I’ve stayed with a pace group. I tend to stay away from packs in races. I ran an 8:07 for mile 8 and still felt good for that point of the race. Spoiler alert: that was my fastest mile of the race. For the next few miles I kept my focus on staying ahead of the pace group and even effort through the hills. Mile 10 was a little tough, and my slowest mile, but I made up for it in the last 5k. I crossed the finish with an official time of 1:53:04. It was my fastest half since November 2013 (when I was five seconds from my PR). Now that feels good! There weren’t as many hills as I remembered, but I think my training is paying off as well. The course seemed a little different in the last few miles, but it was still a challenge. I was so excited that I was so close to running under 1:53. I feel like the four hour marathon is still a realistic goal, so I’ll keep pushing. It was a good race, and I’m so glad I went. It totally energized my training. and a Texas sized medal! 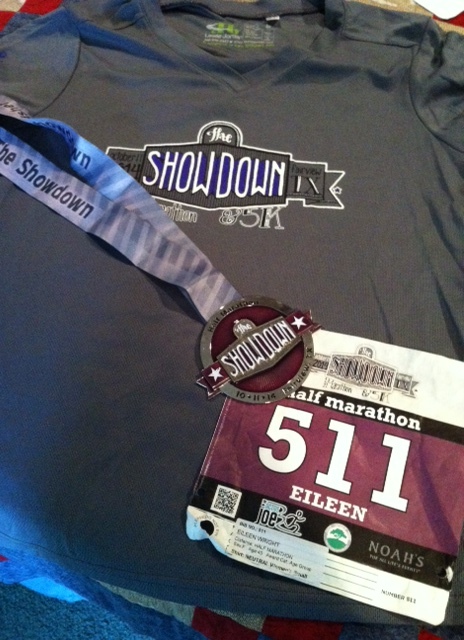 For the second time in as many years, I ran the Showdown Half in Fairview. Last year, I was a pacer and this year was a totally different experience. Gone were the jitters of being able to lead others to their goals, and instead were the nerves of seeing what my body was capable of over 13.1 miles. My half marathons so far this year have been few in number, painful (plantar fasciitis), inconsistently paced, hilly, or just had poor weather. 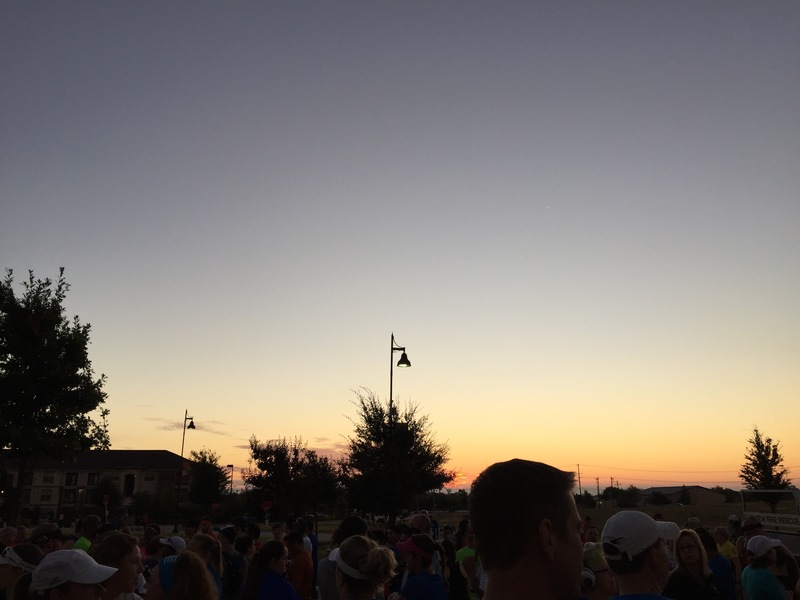 So far, my fastest half in 2015 was the Dallas Rock ‘n Roll with a 1:53:27. I still don’t know how I managed that with my foot pain. After my Thursday workout last week, which consisted of repeats based on minutes and effort, I decided I liked the way the miles ticked off without me watching my pace. I can’t explain it, but it just felt better. So I decided I’d try running by effort on Saturday instead of pushing a pace. I didn’t foresee a PR, and since I’m in the middle of marathon training, I didn’t know what to expect. Saturday morning I was ready to race. I have found that by cutting back my races this summer/fall, I look forward to them more. I had two loose goals in my head. 1) Break 2 hours. 2) Stay under 1:55:00. I lined up with my friend right in front of the 2:00 pace group. Once we started I let the pace come naturally. By mile three, I had pulled ahead of the 1:55 pace group, and that’s where I stayed. I didn’t check my pace. I gauged my effort on my breathing. The temps were in the mid 50s, so it was wonderful running weather. The only area I had trouble was with the sun. I felt like a vampire, since I do most of my training in the dark. The sun was blinding me, and we were running right into it for most of the first half. The downfall of my running by effort plan was forgetting about the hills. The second half of the race was extremely hilly. I guess I didn’t notice them so much last year because I wasn’t pushing as hard. By mile 10, I thought I might cry if I saw another uphill. Then there it was. I kept pushing, breathing like I was in the last mile of a 5k. It was rough. I reminded myself of my fast finish long runs, and running up a hill to get home. This is what I’ve been training for – races like this. I kept going, periodically checking my overall time with the mile markers in the last two miles. Up until mile 10, it seemed I was on track to run under 1:53, but the hills were zapping my energy. 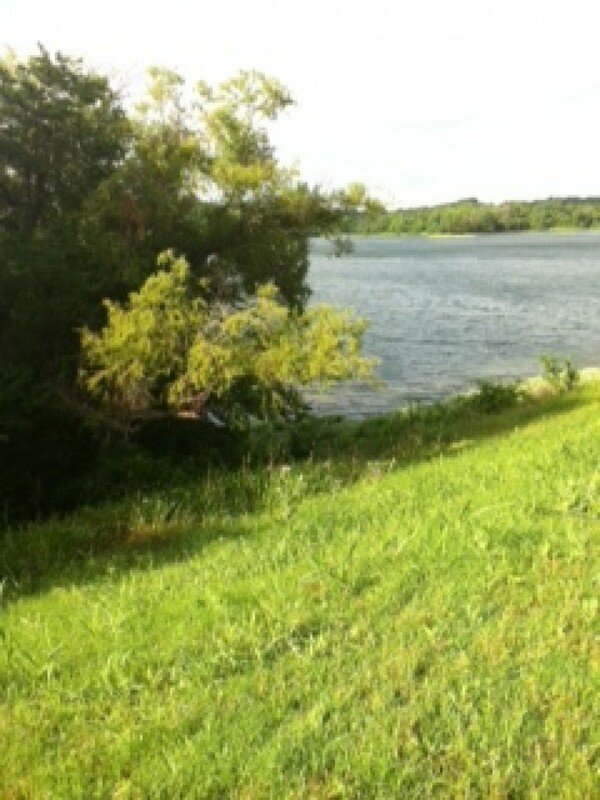 I finally took a few walk breaks in the last mile until the nausea subsided. I was out of Nuun, and my last gel (from mile 9) didn’t seem to make its way down smoothly. I was so happy to see the flat area that led to the finish line. I grabbed my food and found a curb to sit on. I was wiped out, but so glad for the chocolate milk! The medal was pretty great too! Then I hung out with others from our local group. 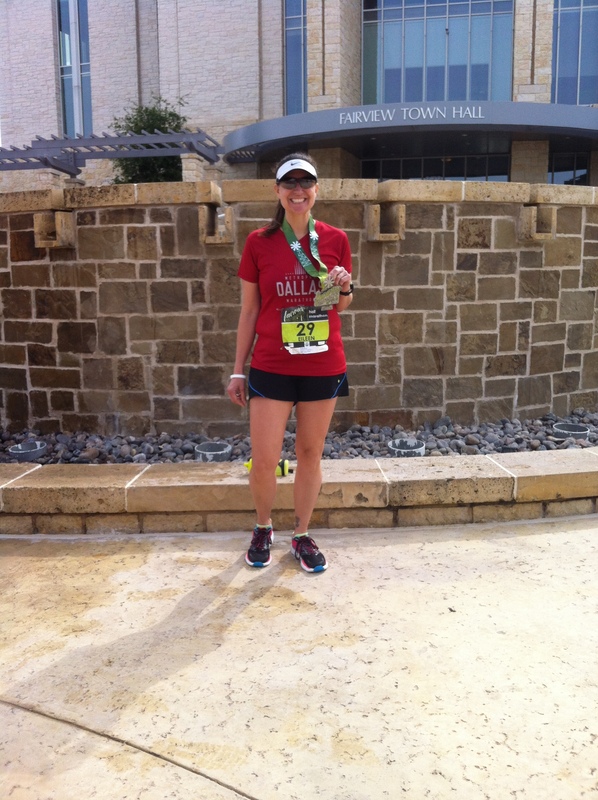 One runner ran her first half marathon, exceeding her goal. I love seeing the joy from doing more than you thought possible. My official time was 1:54:28 so I met my two goals. I think if the course was flat I could’ve run under 1:53. But I’m happy with my progress, and so excited to finish a half marathon pain free. My foot is doing excellent this time around. It really was freeing to run without checking my pace constantly. Although I did have an idea of what my time was, it was good to tune in to body and effort level. I still need to work on my mental game though. I had a few arguments with myself over the last three miles. I’m trying to decide if I want to add one more tune up race in my training in early November. There are a few good ones to choose from. It also seems that I’m in a good position to keep my 4 hour marathon goal for Dallas. On Saturday, I ran my fourth half marathon for the year. I have never run the Fairview Half Marathon, but I volunteered for the 5k last year so I got a good price on my registration. Of course, when I registered I didn’t expect to be battling this foot problem that’s plagued me since the Dallas Marathon. I haven’t talked much about my first running injury, partly I think because I’m in denial, and partly because I’ve still been able to run mostly pain free. I’ve tried to pinpoint what caused it, but more on that next week. Let’s talk about the Fairview Half. I started participating in the Active Joe races because the reputation for them is great. Word of mouth, through running groups and the local running community speaks volumes. Also since I live about an hour north of Dallas, to have a half marathon within about a half hour drive is wonderful! 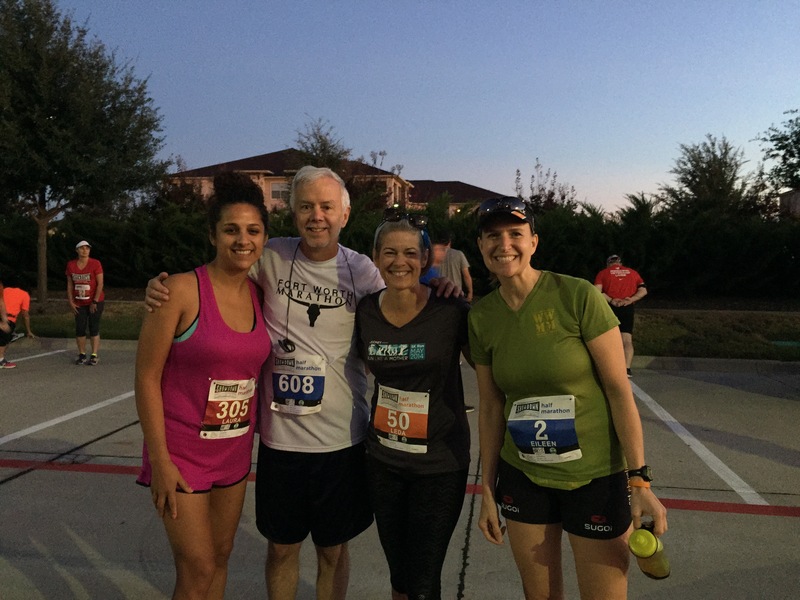 My running friend and I headed out Saturday morning with different goals and expectations, but looking forward to another race together. I read that the course was hilly, but since I run on hills that didn’t concern me. Life also happened the past week when our dryer went out. My weekday miles were lower than usual, which helped control my heel pain, but I felt unprepared. 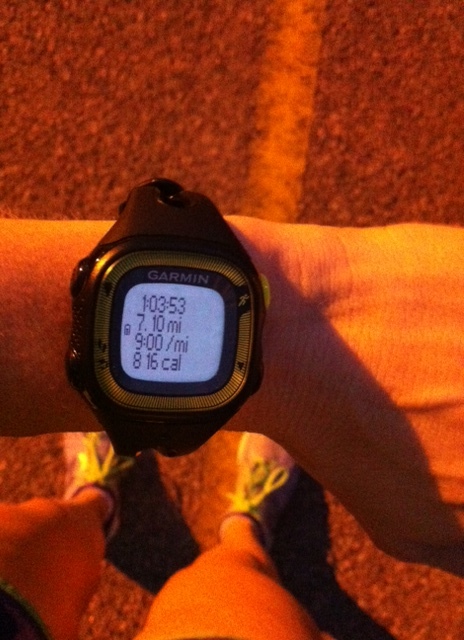 My last double digit run before Saturday was the Rock ‘n Roll Dallas half. I planned to take a week (or two) off after the race to see if I could completely heal my plantar fasciitis. I also want to give my body a break from pushing and see if it helps drop the marathon weight gain and build speed by changing things up. So basically I went into the race ready to be done. I know that’s not the way to do it, but honestly that was my feeling. But I didn’t let it change my race tactic. 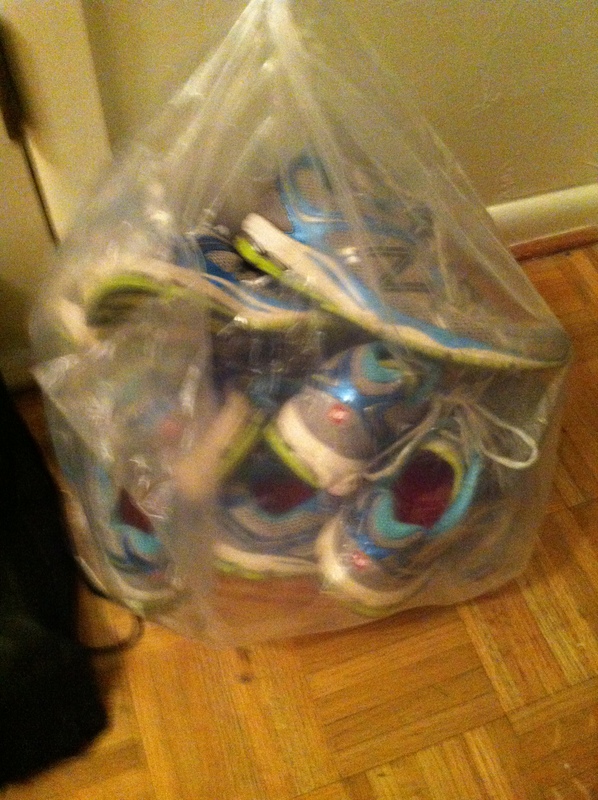 But first, I donated some retired running shoes at packet pickup. So I have a favorite shoe…and a problem apparently. The weather Saturday morning was perfect. I started just ahead of the 2:00 pace group with an 8:45 first mile. By the end of the 2nd, I had my average down around 8:30, and that’s where I stayed until mile 8. The hills were no joke. There was a tough one at mile 2, and again around 6. But I focused on keeping my effort up. I spotted another monster uphill around 8.5. I willed myself to keep pushing, but as I crested the top I lost over a minute on my time. The wind had been sucked out of my sails. My legs were feeling like jelly and the four mile runs during the week sure weren’t helping me at mile 10. For the final mile, I pushed through with what I had left. My foot let me down and affected my gait for the first time in a race. I began to run/walk/hobble my way through the last ten minutes and was so glad to see the finish. Not pictured: the chocolate milk I downed as soon as they handed it to me. The medal is huge, and a nice windmill spinner as a bonus. Even my kids commented on how big it was. The mini bundt cake was pretty great too! My official time was 1:58:29 (pace 9:02) which was slower than I wanted, but not bad considering my late problems in the race. It further enforced the idea that I need a run-break to heal. I am glad l managed to stay under two hours considering my problems. Later that afternoon (after a shower, ice, and compression) we did some shopping. Now I’m not limited to boring hours on my stationary bike. And since we spent money, my frugality won’t let it get dusty. An added bonus: Sunday afternoon my husband and I went for a ride together. 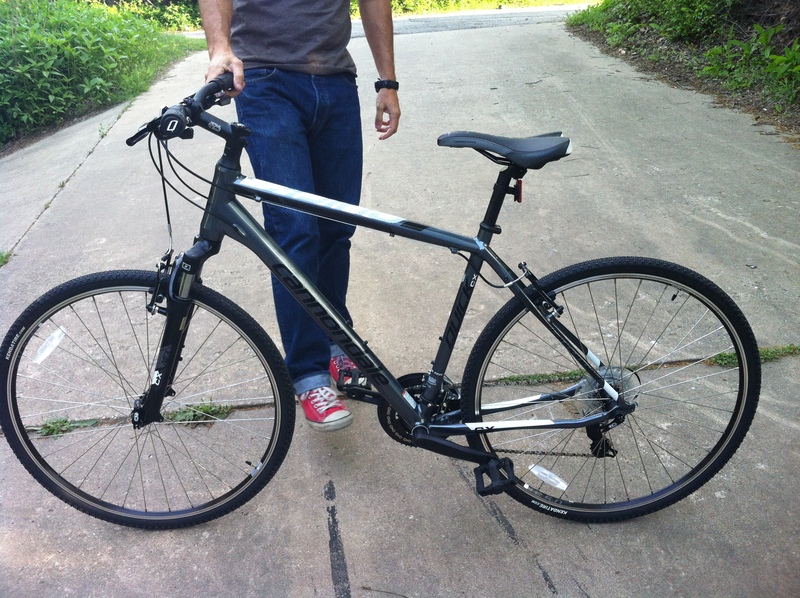 He helped me build confidence, because it has been a few years since I rode a bike. My foot didn’t hurt after an hour of riding, but boy my seat sure did! Oh well, it feels good to be moving! This week starts the second half of my 18 week training cycle for the Dallas Marathon. I’m not going to lie; there have been a few rough patches. The humidity has been higher this year it seems, and most of my speed and tempo runs have been at 75-80 degrees with 80% humidity (or higher). I’ve had some sweat drenched running clothes and not so easy “easy” paced runs. In addition to tough workouts, I seem to have become inept in the kitchen. I broke my own rule I set back in August. My sixteen year old needed to bring homemade chocolate chip cookies to school a few weeks ago (with night before notice). She was going to make them, but I thought I would be nice and help her out while she was taking a shower after band. Translation: I did all the mixing and baking. I must have been more tired than I thought because I misread the recipe. We didn’t realize until after the fact that the cookies were a little salty. Instead of 1/4 teaspoon, I put in 3/4 of salt. Oops. I guess with all the heat, I needed some extra sodium. Training aside, my favorite thing so far this month was my first job as a pacer in a half marathon. The Showdown Half was this past Saturday, and I helped pace the 2:15 group. This gave me the chance to help give back to the running community, without changing my training around too much. I still had the benefit of motivation from a race. This was a great race with so much energy. The skies were overcast, and temps were in the high 50s. There were a few minutes of misty rain, but it felt wonderful. There were a few hills especially in the second half, but a nice course. 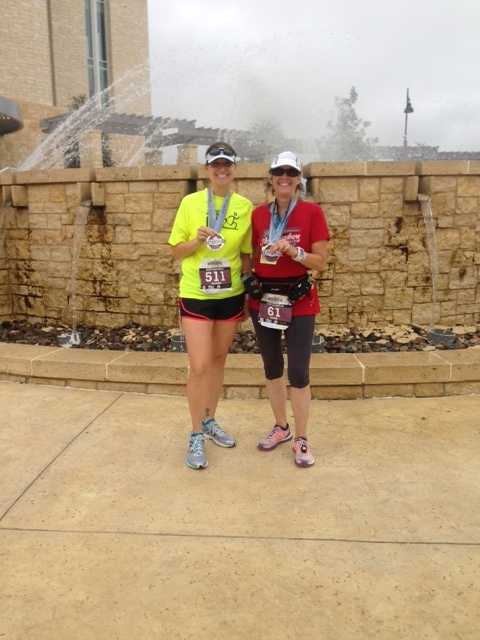 In our group there were at least two first time half marathoners, and a runner who set a 10 minute PR. At one point around mile 10, he told me he thought he shouldn’t be feeling this good running 10:15 miles. He expected to be running 11 minute miles at that point. When we got to the last quarter mile, I sent them on ahead to finish strong. A friend of mine, who was running her second half, set a 15 minute PR! Awesome! 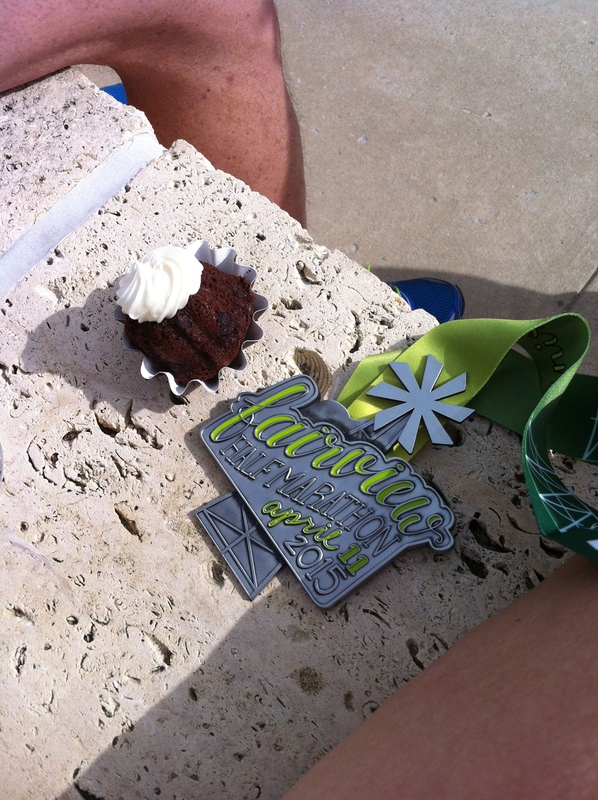 I would love to have the chance to pace another half marathon. It was nice to take the focus off my own training and encourage someone else, to remember what it’s like to achieve new distances and paces that were thought impossible. It renewed my motivation. Monday, I finally had cooler weather for a speed session. I headed to the track with 61 degrees and wind for 1600 meter repeats. My goal was 7:30 for each one. I ran 7:27, 7:29, and 7:33. The funny thing about the speed sessions is that whether I’m running 400 or 1600, the lap time is still the same. That should mean the shorter sessions were easier, right? Yeah, okay. I’m content with that portion of my training, and next week I’ll move into strength workouts – where the distances are longer. Now I’m off to bed for tomorrow’s early tempo run. So excited that it will be cool for 8 miles at race pace. Now, let’s see if I can get it. Don’t forget, you can follow my training at Daily Mile or connect on Instagram. The links are on the home page.